Reviews | No Smoking Sign - Black and White, 9" x 3"
No Smoking Sign - Black and White, 9" x 3"
Show your customers and employees that smoking is not permitted in the area with this 9" x 3" no smoking sign! Made of durable plastic, this sleek sign has great color contrast. The white-on-black lettering allows your customers to see and read this sign from across a room or parking lot. For those who may have trouble reading, a single no-smoking symbol is posted to the side. This is an excellent no smoking sign. It is made with a very durable plastic material and also already comes with adhesive. Super easy to hang ups and sticks well. Anyone that runs a restaurant knows these are a must - both to let the customers know what is expected and also for health inspection purposes. Recommend putting them at eye level height. They wipe clean also which is nice. Great visible sign to adhere to any wall. It comes with a strong adhesive on the backside. The message can be clearly read from a far distance. This No Smoking Sign is great for areas outside of my restaurant where I do not want the customers smoking and is great for various lighting scenarios due to is very bold and prominent print that catches the eye of many of my customers walking by it. Very visible sign! Love how it even has a visual picture of a cigarette crossed out. It was easy to install and i highly recommend this product. I bought this along with some other signs, and was not expecting much especially for the price I paid. But I was nicely surprised by their quality and polish finish. I don't think anyone likes to smell tabbacco smoke around food. This rule also applies to a walk up establishment such as ours. The sign informs the patron and doesn't seem to sun bleach with time. this is a well made sign that sticks very easily to any wall or dry surface. another reviewer said their sign has braille, but the sign i received is smooth with a clear cover. You can simply mount it on a wall or door with the included self-adhesive backing. Keep everyone in the area from smoking by hanging this sign in or around your building. Great and simple sign. The self-adhesive stickers on the back make it easy and fast to hang. It is also nice that the sign has braille as this may be required. Nice sturdy construction. Bought this to hang on my porch for my Airbnb guests. Clear and to the point. Comes with adhesive stickers on the back which makes mounting a breeze. Plain and simple "No Smoking" sign. Not much to say. It's a good thing to have around when you own a business. Fair price, too. I have been pleased with this nine inch by three inch black and white no smoking sign. It is not an obnoxious sign as I have seen in other brands and is the perfect size for any door. It is very easily read from a distance. It is very easy to clean and does not take up much space when stored. I would recommend and would definitely order again in the future. I also hope to see bulk purchasing options available in the future. This no smoking sign ensures that we are a friendly place and makes sure that people are well aware of the no smoking policy we have inside. It adds a bit of decency as well. This can go anywhere as no smoking inside is the best. These signs are the right price and are very noticeable when placed in an area where everybody walks by. A well made light weight plastic glossy sign that looks good, serves it's purpose, and installs easily with the adhesive strips on the back. Allows you to meet LCB laws. The best thing about these signs is the quality of material they are made of. They come with adhesive strips on the, so they are ready to be placed. Make it clear that smoking is not allowed. Easy to mount! Bought it from webstaurant store. Works real well. Does the job. Strong and sturdy! Would buy again. Price is right, too! 4 stars! After finding this one, we never went back to the white plastic ones! Easy to stick, durable, and lasts a long time. And it's just the perfect size! Works perfectly for our business! Great quality and approved by us! Thanks again for giving quality products in a fast manner! Love all your products! Very sturdy sign, professional looking, perfect for our purpose. Easy to install and easily visible in each area. Just make sure you have thoroughly cleaned the area where you will install. Great sign for any new retail or restaurant operation. We live it because we want a smoke free environment in our business. It is made of hard durable plastic. i bought this item for my restaurant as a wall sign for customers its very nice and light weighted sign i have this inside on my restaurant wall . A black sign with No Smoking and the symbol for no smoking in white. Its lightweight plastic and has adhesive on the back for easy hanging. 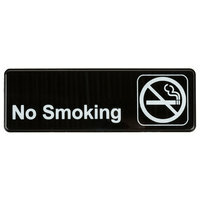 Very nice sleek black and white no smoking sign. Our establishment does not allow smoking inside the eating area or outside the restaurant store front. It's black. It's white. It clearly says "No smoking". It looks reasonably professional. And the adhesive works. What more could a person ask for? Perfect. New LCB laws require these signs be posted throughout the building. Where are you supposed to buy 2-3 signs like this? Thanks to Webstaurant store. We believe most restaurants do not allow smoking, but to encourage other that we are proactive in preventing this, we wanted to place a sign on our wall to ensure there is no smoking in our store. When you need to put up a sign, these work. Easy to stick on most surfaces. We purchased one for the restroom, the kitchen, and the seating area. Just in case people get the hankering, this makes our policy on smoking clear. I like having these clearly posted so there is no confusion. Well, the price is right for something that's mandated by law! It's as advertised. The adhesive didn't last forever, but we just set it on a ledge after that. And that price! Worth it. Not too small, not too big either. Just perfect size to put in the restrooms. It came individually with the sleeve. It has the tape too at the back, so I just peeled the tape, and stick it on the wall, and done. Like the material and the polish. The No Smoking sign fits perfectly in my shop. It is the perfect compliment to the wall color I chose, and it is highly visible. This sign is a nice, sturdy plastic and hangs nicely! The graphic is nice and the font is easy to read. More than meets expectations!